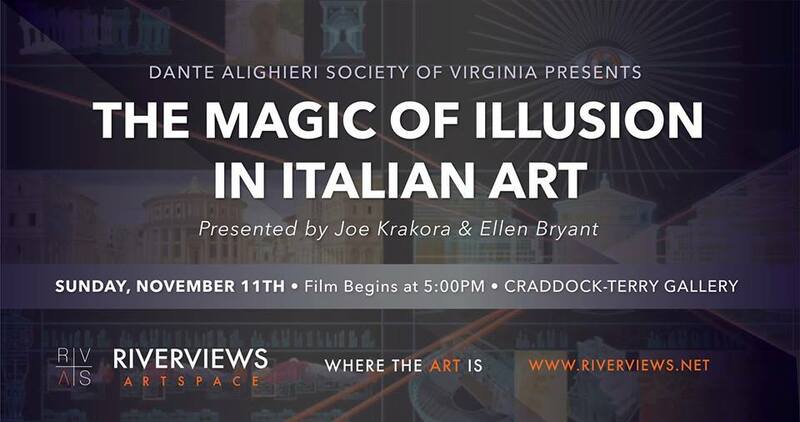 In partnership with the Dante Alighieri Society of Virginia, Riverviews Artspace will be screening 'The Magic of Illusion in Italian Art' presented by Joe Krakora and Ellen Bryant. The Magic of Illusion is a film about how we see, what we see or what it is we think we see. Al Roker guides us on a journey into the secrets of illusion, utilizing special effects to illustrate the artistic and visionary discoveries of the Renaissance. While Copernicus and Columbus were changing our understanding of the world, the Renaissance masters were dramatically changing the way we see that world. The film uses new technology to look at old masters in new ways.